La Casita Roja is an immaculate private residence decorated with a Mexican flair. It is located in a quiet, west side neighborhood within the beautiful City of Sedona. Access to numerous National Forest Service hiking and mountain biking trails are just around the corner. This makes it an ideal location for hiking and mountain biking. La Casita Roja is within walking distance to restaurants, art gallery, movie theaters, spas and shopping. Relax in the hot tub spa or on the secluded patio and be mesmerized by the red rock views of Thunder Mountain and clear night time skies. Inside, enjoy the bright, cozy, modern living space featuring a comfortable living room with wireless, high-speed internet (wi-fi) , gas fireplace and flat screen cable TV, all brand new furnishings! The complete kitchen has solid surface countertops and a drip coffee maker as well as a K-cup coffee maker. Both bedrooms feature a queen sized memory foam bed and a flat screen TV. The home has two bathrooms with showers. There is also a washer and dryer for your convenience. 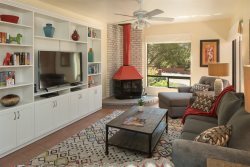 Fully licensed short term vacation rental property by the City of Sedona. Proudly owned by Sedona locals - committed to your enjoyment. Spotless clean. Well appointed. Loved this property! Should include directions to recycle center. Your staff was extremely helpful and knowledgeable! My friend and I had a fab time and were very comfortable in this lovely home. Thank you! The electrical plug to fire place is for a blower that the owners don't use. As long as the front glass doors of the fireplace are left open, it will heat properly. See instructions in the guest directory & on the remote in the home regarding operation of the fireplace.